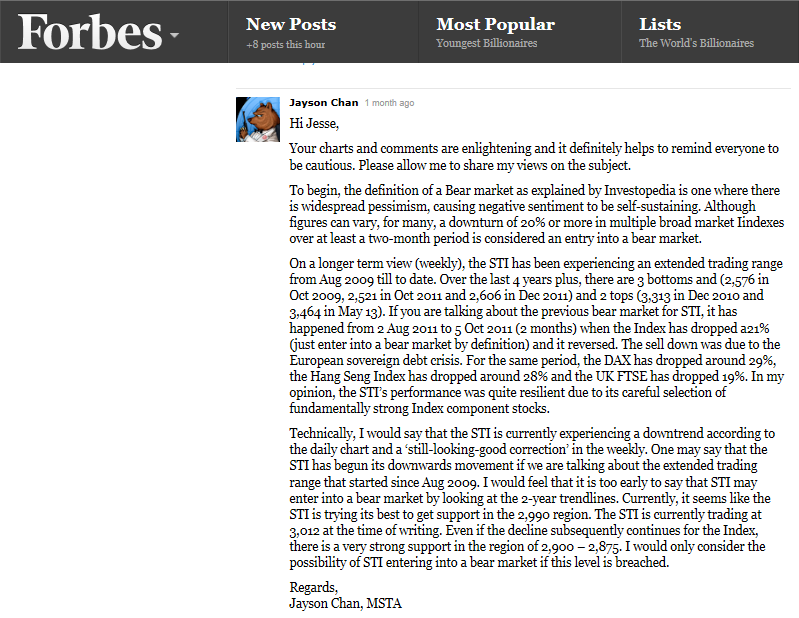 Posted on 21/03/2014 by Jayson	in Trading Thoughts and tagged Forbes, Singapore's Bear Market, Thoughts. 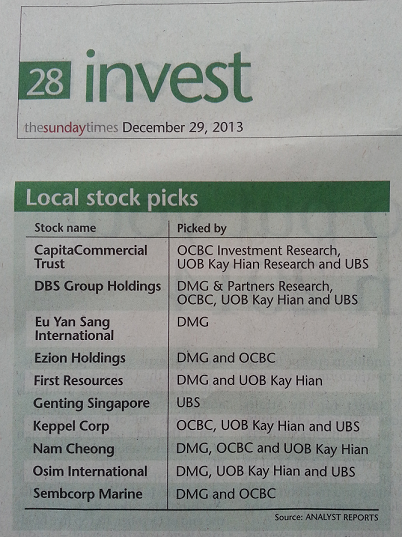 On 3 Feb 2014, an economic analyst wrote an article in Forbes saying that “Singapore’s Bear Market May Have Just Begun”. I looked at my chart and challenged his views technically. True enough, the market rebounded and turned out as what I have expected. Just some sharing of my thoughts with you guys. Cheers and have a good weekend ahead. 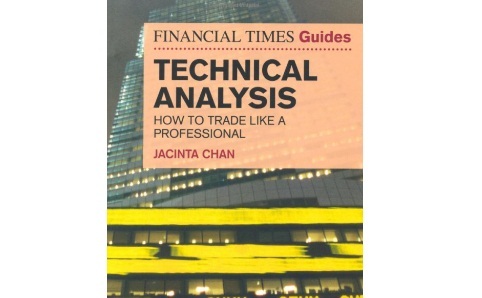 Posted on 27/05/2013 by Jayson	in Trading Thoughts and tagged bamboo-style, Capital Dynamics, iCapital.biz Berhad, intrinsic value, Tan Teng Boo, Thoughts, value investing. Asian-style global investing – Capital Dynamics founder and fund manager Tan Teng Boo uses a flexible ‘bamboo’-style value approach towards international equity investing (By Kelvin Tan). Below is an excerpt (gist) of the article. 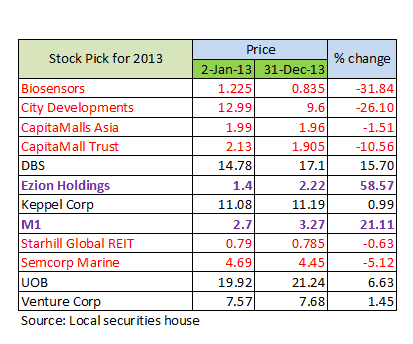 To achieve long-term gains, Tan bascially uses a value investing approach with a global macro overlay. Like most value investors, the fund manager evaluates the attractiveness of companies by comparing their long-term intrinsic value and current traded stock prices. Companies which are traded at a deep discount to their intrinsic value are said to offer ‘a good margin of safety’, he says. But for stock-picking in emerging markets, Tan – differing from traditional bottom-up value investors – takes into account macro-economic factors such as GDP growth, inflation rates, interet rate, and politics. He reasons that using a pure value investing approach in Asia and other emerging-market regions does not work because there are many other external macro factors that influence the price of stocks. “If you invest in the US, you don’t have to worry about capital controls and you don’t have to worry about who will be the next prime minister. If you apply [the] Fishers/Graham [value investing] method in Vietnam, South Africa or Malaysia, you will be dead,” says Tan. A classic case is Malaysia, where politics is a crucial factor that could impact the prices of stocks, according to the Capital Dynamic founder whose company manages a Bursa Malaysia-listed, closed-ended Malaysia equity fund called iCapital.biz Berhad. “If you see a new government the next day, all those existing government-related companies would have been bashed. So, in emerging markets, you cannot take the typical Benjamin Graham and Warren Buffett value investment approach because valuations of companies are not just a function of how well they are run. The social and political milieu should also be taken into account,” says, Tan, who describes his value investing approach as “intelligently eclectic”.